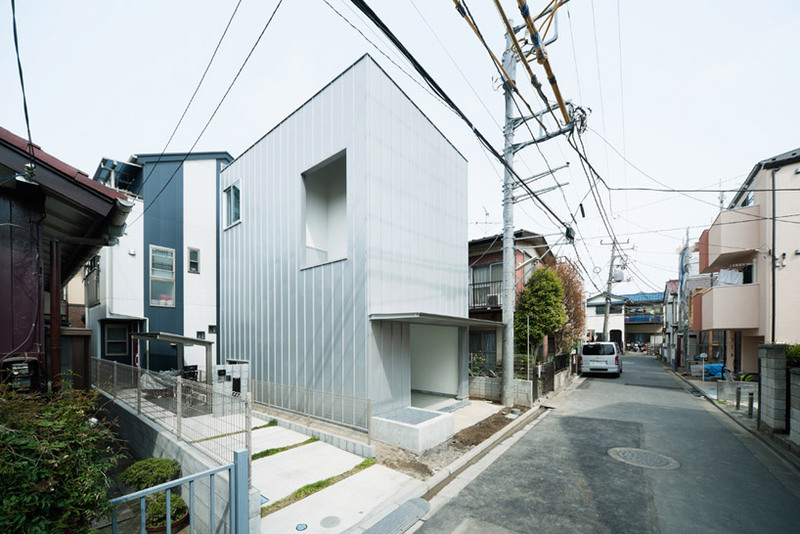 japanese practice ryuji fujimura architects has completed ‘storage house’, a single family dwelling in kanagawa, a suburb of tokyo, japan. addressing the street, a wide canopy above the garage creates an image similar to a loading dock, allowing the partially enclosed entry hall to be used as a gathering space for visitors when a car is not present. the steel volume contains three levels of spaces within a two storey structure, utilizing the underground space to maximize the floor area. connected with open-riser stairs for an airy living room, intermittent half floors serve as landings with a function, generating a lofted space. perspectives between the various elevations create layered views through the home. a double height wooden bookshelf spans from a half floor to the ceiling for the first level, continuing into a cavernous loft within the master bedroom. glass windows within interior partitions create cross vision panels through to a lower area while concealed openings with doors may be opened for an aerial view or for quick communication. Spectacular use of space! I wish these would pass zoning and building codes in American cities. I would definitely love to live in one of these as they utilize a very small footprint. Wow. My future home, please? 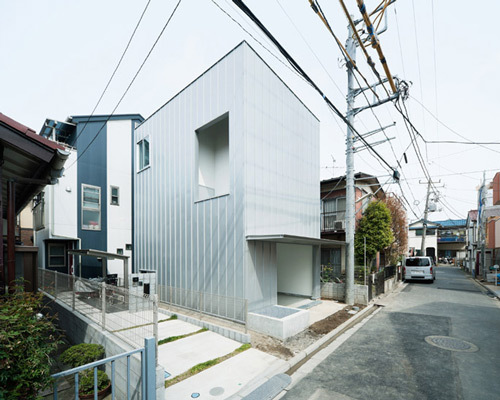 it’s typical Japanese young architect’s work……..